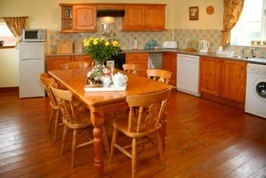 A former milking parlour that has been tastefully renovated into a spacious family holiday cottage sleeping 5 + cot. Graded with 4 stars The Dairy Cottage offers comfortable accommodation with the added benefit of being all over one level, lending itself to the less able and families with small children. 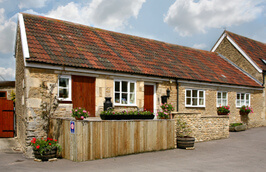 A former milking parlour that has been tastefully renovated into a spacious family holiday cottage sleeping 4 + cot. 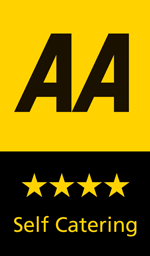 Graded with 4 stars The Dairy Cottage offers comfortable accommodation with the added benefit of being all over one level, lending itself to the less able and families with small children. Enter the property directly into a very large kitchen diner finished in light colours with fully fitted pine cupboards and wood flooring. A farmhouse table seating 6, sits central in the kitchen and all the mod cons expected have been provided including dishwasher, washing machine and stainless steel oven, hob and extractor. The lounge offers a comfortable area to relax and unwind with a glass door to rear of property. With wooden flooring, rugs and quality soft furnishings. A freeview television, DVD player and CD unit are provided for your entertainment. 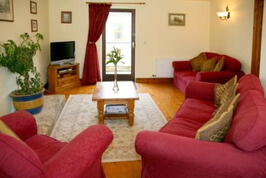 There are two bedrooms in the Dairy, a twin with en-suite and a double with its own bathroom. All finished in light colours and matching Sanderson fabrics and throws. Fitted wardrobes are provided with a range of pine bedroom furniture. The bathrooms are newly installed for 2015 and fully tiled with bath, shower, WC and sink. Outside, The Dairy has ramp access front and rear. It has its own little patio area as well as being just a few steps away from our paddock with play equipment, and open air solar heated swimming pool. There is plenty of on-site parking available and our own little farm shop/butchery for all your breakfast needs! Food Stores: On site farm shop. Holt Convenience Store - 1.5 mls. Sainsburys 3 mls. Bath, Longleat, Lacock. Numerous national Trust properties, with Chalfield Manor (walking disntance from farm). Salisbury, Stonehenge, Avebury, Bristol.